(15/P17) TRENTON – Due to pressures from increased harvesting of northern diamondback terrapins in coastal areas of New Jersey, Department of Environmental Protection Commissioner Bob Martin has signed an Administrative Order closing the remainder of the commercial harvest season for this turtle species. The diamondback terrapin is the only species of turtle that lives in the brackish waters of New Jersey’s coastal marshes and estuaries. The commercial harvest closure is effective immediately. In addition, the Administrative Order calls for tougher enforcement for illegal harvesting of terrapins. Division of Fish and Wildlife Conservation Officers will be on the lookout for anyone illegally harvesting terrapins. Violators will be prosecuted. Commissioner Martin has also directed DEP staff to work with the New Jersey Marine Fisheries Council to recommend management strategies to enhance protection of diamondback terrapins. 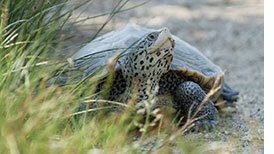 Diamondback terrapins are harvested primarily for gourmet cuisine as well as for pets. Demand for the terrapin is particularly increasing in Asia. In an incident last year, as many as 3,500 terrapins were harvested from two locations in southern New Jersey to provide terrapins for an out-of-state aquaculture facility that raises them for overseas markets. Conservation Officers also recently prevented some 800 illegally harvested terrapins from being sent to the same facility. New Jersey is joining other states in the region to close commercial terrapin harvest seasons. In New Jersey, the season runs from November 1 through March 31. In addition to civil and other penalties, anyone charged with illegally harvesting a diamondback terrapin will be assessed a $200 replacement fee for each terrapin in his or her possession. Once abundant, terrapins decreased dramatically by the 1930s, due primarily to harvesting for food. Numbers started increasing again by the 1960s, but in recent decades the terrapin has been at risk again due to habitat loss, drowning in crab traps, and vehicle strikes. Steps have been taken to develop crab traps to prevent drowning. Also, concerned citizens and groups along the coast, notably the Conserve Wildlife Foundation of New Jersey and the Wetlands Institute in Stone Harbor, have worked hard to protect the species, taking steps to reduce deaths from vehicle strikes and releasing into the wild baby turtles incubated from eggs from nests of females killed by vehicles. Diamondback terrapins, so named for the diamond-shaped patterns on its shell, are more closely related to freshwater turtles than marine turtles, and spend their entire life cycle in coastal marshes. They are an important part of the ecosystem, feeding on snails that can overgraze marsh grasses, leaving them barren mudflats. The New Jersey Marine Fisheries Council and the Endangered and Nongame Species Advisory Committee recently requested the DEP support an immediate closure of the commercial harvest to protect the species from increased pressure on harvesting in New Jersey waters created by bans on harvesting in other states. Although the diamondback terrapin has not been listed as threatened or endangered in New Jersey, its status is listed as decreasing. As part of the state’s recovery effort, the DEP will be conducting investigations of populations, ecological data, and habitat needs as it develops management strategies.